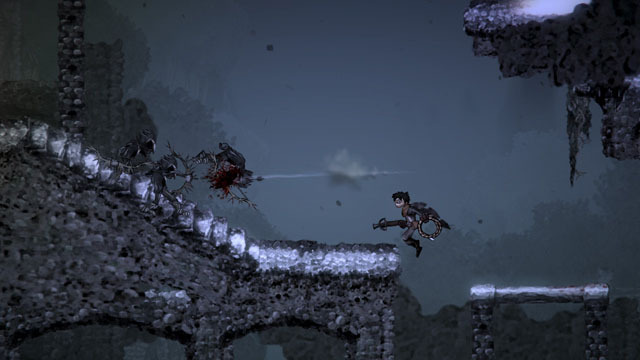 Salt and Sanctuary, from Ska Studios, is a "soulslike" (a.k.a. Dark Souls-inspired) action-RPG. The game offers a high level of difficulty, a complex interconnected world that the player is free to explore, and a limited number of health-restoring safe areas called sanctuaries. The player may select between numerous character classes, each with their own strengths, weaknesses, and gameplay styles, which may be further enhanced via a robust skill tree. The game offers hundreds of unique items, a variety of upgradeable weapons and armor, and a handful of healing items that the player must maximize in order to survive. Players harvest salt from defeated enemies, but risk losing it all if they are killed, and salt is needed in order to upgrade equipment and level up. This is a dark and unfriendly world that is meant for hardened gaming veterans. The game is now available for PC, Mac, and Linux via Steam, PS4 via PSN, and also planned for Vita. Check our coverage here.